Ringworm is NOT a worm, it is a fungus. Ringworm spores can travel great distances on air currents and can be brought into your home on your clothing, shoes, and by your dogs and other pets. Basically, ringworm spores are everywhere in the environment; outside as well as inside our homes. At some time or another, anyone who owns (or has owned) a Persian cat knows that they will have to deal with ringworm. In our opinion, any cattery that says they have never had a case of ringworm may have failed to recognize the signs of infection in their cats. 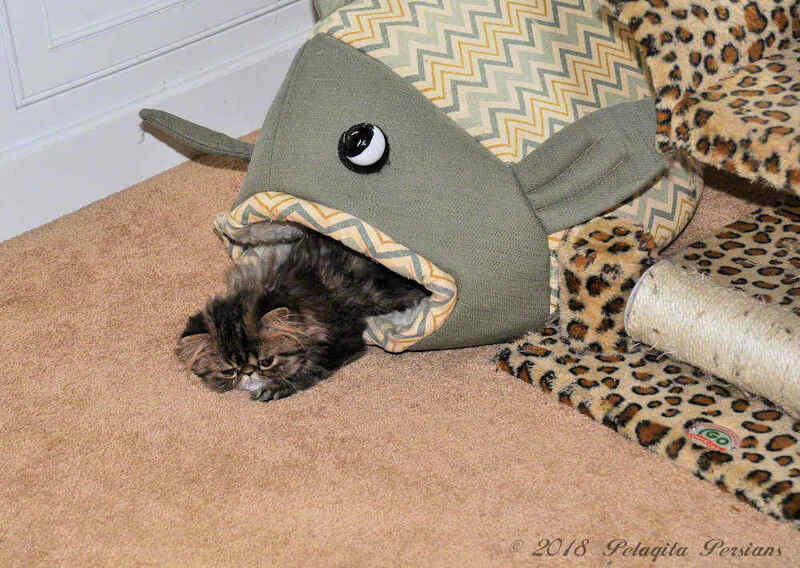 In our experience, ringworm and Persian cats (and other long-haired breeds) go hand in hand. Especially, when bringing in a new cat from another cattery. The stress of the move and the age of the cat, can all play a part in that new cat or kitten developing ringworm within a few weeks of coming to a new home. The very young, the very old and immunosuppressed cats or kittens are at the highest risk of getting ringworm. Ringworm exposure is why it is imperative to isolate or quarantine a new Persian kitten or cat for at least four weeks in order to make sure that it has not developed ringworm and could potentially infect the other household pets. Sometimes, a cat can be an asymptomatic carrier which means that it can have ringworm, but not show any signs of having it. However, a carrier sheds the spores and infects other cat(s) in the household. Ringworm is a zoonotic disease (can be transmitted from animals to humans). If left untreated, ringworm can be very difficult to eradicate from a household because the fungal spores can contaminate the environment a cat is housed in. Ringworm is a systemic disease which requires treatment with an oral medication as well as an anti-fungal dip (Lime Sulphur Dip) for the spores. Failure to use this two prong approach means that the Ringworm will not be fully eradicated! I fog the cat room several times a year with Virkon S (an anti-fungal solution) as well as fog our entire home at least twice a year. Despite these precautions, there are times that a new Persian cat brings ringworm in and I have to treat that new cat. The purpose of this article is to educate people about ringworm and how to effectively treat it. Sporanox® (brand name) - oral medication (generic name: Itraconazole). This medication should be administered under the care and guidance of a licensed veterinarian as it can damage the liver. Sporanox® is usually dispensed in a 150 mL bottle, at 10mg/mL strength. The dosage for treating ringworm in cats is 10mg/kg once a day (or 0.50 mL per one pound) and should be given with a high fat food (a tab of real butter in their canned food is best). The liquid medication seems to be easier to dose as it is more accurate for dosing than the pills. The cat also has to be fully treated for at least 21 days with the oral medication and the fungal dip every 5-7 days for at least a month beyond the 21 days of the oral medication treatment. Do NOT skip a day! Again I must reiterate, this medication is hard on the liver and the cat should have free access to water at all times! If you notice anorexia, dehydration or other symptoms, discontinue the use of Sporanox® immediately and contact your veterinarian. Lime Sulfur Dip is an antiseptic, keratolytic dip in scentine lime sulfur concentrate for the treatment of Sarcoptic mange (ringworm). 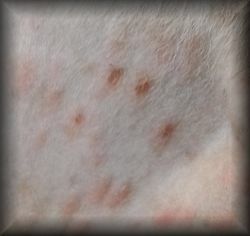 Lime Sulfur Dip treats ringworm on the skin and hair of the cat. "Dip" the cat at least once each week and continue for at least 30 days beyond the cessation of the oral medication. Mix the Lime Sulfur Dip according to the bottle directions which is usually 4 ounces of Lime Sulfur Dip to a gallon of water, put the cat in a small tub and apply the Lime Sulfur Dip solution by pouring the solution over the cat to coat its back, neck and chest areas. Note: Soaking the cat in water until it is wet to the skin beforehand applying the Lime Dip helps the Lime Sulfur Dip penetrate down to the skin better. Make sure the Lime Sulfur Dip gets into the nooks and crannies of the cat's claws, use a soft toothbrush to gently "scrub" the Lime Sulfur Dip into the toes, nail beds and in between the toes. Do NOT rinse off the Lime Sulfur Dip . (Do NOT get the Lime Sulfur Dip in the cat's eyes or mouth as it is very caustic. Follow label directions if this happens.) Gently pat the cat with a towel and then completely dry the cat using a dryer. Do not let the cat lick the wet/damp Lime Sulfur Dip solution off of its fur. Once the cat's coat is completely dry, the cat may safely bathe itself without adverse effects. Lime Sulfur Dip stinks like rotten eggs - the house will stink, the cat will stink - everything will stink. However, it will kill the spores on the cat. If you want to make absolutely sure the ringworm is gone, you can ask your vet to follow up by doing skin scrapping and getting three negative results (the veterinarian will recommend when these skin cultures should be done). The Lime Sulfur Dip, coupled with the Sporanox® oral medication, will definitely eradicate the ringworm and your Persian cat(s) will be ringworm free. This is the only sure fire way to successfully treat ringworm in the Persian cat breed!!! Additionally, part of treating ringworm is either getting rid of (or disinfecting with bleach) all bedding, scratching posts, cat trees, litter box(es) and anything else the cat may have come into contact with. Every week after dipping the cat, clean and disinfect all cat-related items (bedding, litter box, scratching post, etc.). If the infected cat has been in contact with other cats in the household, it is best to treat every cat in the household to avoid cross contamination and possibly passing the ringworm back and forth for months on end. Again, a word of caution, do NOT get this solution into the cat's eyes or mouth as it is extremely caustic - and avoid contact with your eyes. It is also a good idea to wear gloves to protect hands and wear eye protection. Please note: Sporanox® is a prescription medication and should ONLY be administered under the care and guidance of a licensed veterinarian.